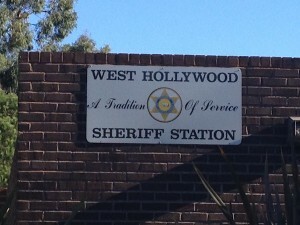 Below is the weekly crime report from the West Hollywood Sheriff’s Station that calls out incidents in WeHo from June 6 to 13. The times are indicated in as Military Time, a concise form in which midnight is indicated as 0000 and noon as 1200. The number at the end of each incident is the case number. 1000 Block La Cienega Blvd. @ 1600-0130, a male transient was arrested after being found with items taken from two recent residential burglaries. Loss $700. #03225 & #03226. 8500 Block Melrose Ave. @ 0245 hours. The victim was followed after leaving a nightclub and robbed at gunpoint while walking on the sidewalk by a male adult. Loss – Necklace and watch. #03227. 7100 Block Santa Monica Blvd. @ 1900 hours. A male transient removed clothing and a cell phone and left the store without payment. When confronted by store security, the suspect used force in an attempt to escape. The suspect was arrested. #03240. 1000 Block Genesee Ave.@ 1000-2300 hours. A laptop, purse, and three cameras were taken from the bedroom. Entry was made through the unlocked front door. Loss $5K. #03283. 8600 block Melrose Ave. The suspect signed for and kept a mail package intended for someone else. Loss $3K. #03304. 8300 Block Rosewood Ave. @ 2130-1100 hours. The suspect used force on the rear window latch to gain access and removed the rear leather seats and a cell phone. Loss $2500. #03364. 500 Block N. Orlando Ave. @ 0502 hours. Two male adults were arrested after being found in possession of a stolen bicycle and stolen mail. #03360. 600 Block San Vicente Blvd. @ 0005 hours. A male adult was arrested after he took a tip jar from a service station at the CSW Festival and tried to walk away with it. When confronted by an employee, the suspect used force to break away. #03349. On the two occasions when I had to call the sheriff, the response time was less than five minutes. I was very impressed (and, no, I don’t live next to the station). Most crimes go unreported. The time it takes for the sheriff to respond to a petty theft, like a shoplifter is usually too long. In most cases it means an employee has to detain the theif for a period of time. In most cases it is impossible to detain the theif without force and it is distracting to all the other customers. In almost all cases you can wait for an hour for the sheriff to show anyway.. so each business develops its own set of responses that usually does not include calling the sheriff and filing out a report. Well Weho Sheriffs are doing a lot better when you read these crime reports!!!! Still wondering why on earth people still leave belongings in the car during night time or in general. Come on people!!!! !